And they've made it through the first round. A recent collaboration between the Israelian government and ElectRoad, a company focused on enabling the large-scale use of all-electric buses, to develop technology that allows buses to charge while driving has recently passed its first round of testing. This has won the company $120,000 in investment and the chance to test the technology in 2018 on a 1/2 mile route in Tel Aviv. If this testing goes well, an 11-mile path will be implemented between the city of Eilat and the Ramon International Airport. But more importantly, the success of this testing could signal the feasibility of the technology in other countries. While this technology is promising, there are still significant hurdles that need to be overcome. The first is the issue of implementation. ElectRoad claims that they can equip one kilometer of road in a single evening, but this is yet to be tested in a city context. The second problem is that this solution may have come too late because of more recent advances in battery technology. Over the last few years, the cost per kilowatt hour of a lithium battery has decreased from 1000 dollars to 200-300 dollars. Dustin Grace, Director of the battery company Proterra, has stated that “What these auto manufacturers are finding when they’re getting into the $100-to-$200-per-kilowatt-hour range is these vehicles are really on parity with other vehicles.” Therefore, if we just look at these numbers, there is no pressing need to work on rechargeable solutions. The biggest advantage of this form of powering buses is sustainability. The Buses will not use polluting fossil fuels that simultaneously rob the planet of natural resources and damage caused by pollution. If the technology could be extended and applied in cars and other types of vehicles, this could be a feasible solution to the problem of cars and trucks accounting for 20% of U.S emissions. This technology could also contribute to a greener world in a more subtle way: by producing power. 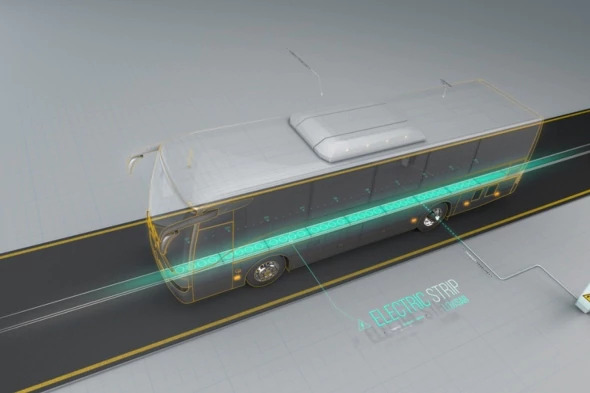 This idea has not yet been integrated into the design, but Oren Ezer, chief executive and co-founder of ElectRoad, claims that the system could be used two-ways, meaning that the buses would feed electricity produced by braking back into the grid.